This is my first EST album. 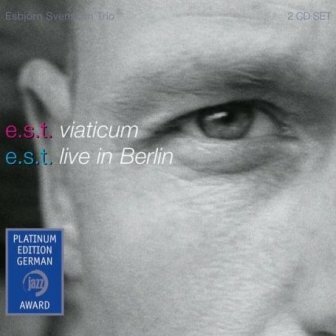 That's true; I have started to listen to Esbjörn Svensson Trio from the album Viaticum. This is also one of my first ACT albums. This fact has a real dependence on my age. I am too young to be a follower from beginning of their career. Tide of Trepidation: This is a great introduction for the album. A melancholic piano tone is supported by a drum with deep drum kicks and a steady bass very well defined at the back (sometimes melodic). We hear an electronic flanger effect at the background. After the first two minutes Dan Berglund’s bass (played by bow) with a distortion effect meets us in melancholy at different times in the piece. Magnus Öström is raising the tension to a little bit higher. Give attention to the deep kicks of Magnus throughout the performance. I think he also sometimes uses some electronics to produce interesting sounds from the drum set. We hear murmurings from Esbjörn Svensson and I like murmuring pianists very much. 88 days in My Veins: A lyrical and generally cold piano is accompanied by a constant rhythm and bass in this ballad-like piece. After a while we hear an addition of another double bass played by a bow, which seems to give the tension to the piece. However when the first slope is finished, we see that the actual tension belongs to the piano triggered improvisation, which is perfectly driven by the drummer Magnus Öström to the end of the song. I believe that there is an emotional link between this piece and "800 Streets by Feet" in the album Tuesday Wonderland. While you are reading this sentence I am killed by this trio. A wonderful performance took my heart and gave it to the music. The Well Wisher: The transition from second piece to third piece is very smooth. The calm and touching rests of Esbjörn and his intimate tone over the drum and bass rhytms, which feels like this is an uptempo piece, are among impressive elements of the album. Especially, the touches of Esbjörn to the strings of the piano while he is leaving the piece in its own tension, are awesome. First three songs are the training sequence of the album to prepare the listener for really cool improvised body. The Unstable Table & The Infamous Fable: That's the first neck in the album where things are going to be a little bit "dirty". You can easily understand that from the drums. After the first minute we hear a wonderful distortion from the double-bass which is warning us that the tension will rise. Give attention to the great performance of Magnus Öström. Esbjörn Svensson gave the improvisational part to his friends and carried out a standard rhythm with his piano. Check out kicks of Magnus, they are perfect. The abrupt decrease in the tension linking the piece to a fantastic piano solo and the following drastic increase in tension through the end make this performance not only one of the best performances of the album but also one of the bests of the band. Viaticum: This piece has the same name with the album, the food for a dying human. It starts with a really dark and slow piano partition (may be largo) of Esbjörn Svensson, which really made us depressed. This is the main theme. Then Dan Berglund comes with a great tone of double-bass repeating the melody. After the first minute with entrance of Magnus Öström and some electronics (most probably sourcing from the double-bass of Dan Berglund) the piece almost sounds like a space-movie soundtrack. It also has a similar sound to the title track of E.S.T. 's very important album, From Gagarin's Point of View. Magnus Öström is carrying this rhythm for so long while Esbjörn Svensson is improvising on the main melody. This must be the best trio jazz song I have ever heard to which electronics is this much well suited. The ending is just like the entrance, a piano solo. I love that song very much, and I am sure you’ll listen to it several times. In the Tail of Her Eye: Magnus Öström is using brushes in this very emotional piece. Dan Berglund’s bass is very deep at the background. We again hear some additional double-bass sounds played by a bow and (may be) supported by some electronics. It is as soft as a silk. I like the part that electronic supported bass play the main theme for a while near to the middle of the piece, after which the instruments stopped gradually. Then Magnus Öström started an atonal solo full of deep kicks and snare drum sounds. This part may sound to be supported by electronics but be sure that it really sounds acoustic and actually these are made by Magnus online with some microphones. The solo ends gradually by the entrance of Esbjörn with soft touches to the piano. The decision is made by the trio just after Dan Berglund’s bass, however the song ends here and you understand that this is introduction for the next song. Letter from Leviathan: As explained above, this is a continuum of the previous song. The trio goes on to play the melody given just after the improvisation. Magnus Öström gives a Middle Asian like rhythm to the song especially by using the kicks. The piano and the bass play the main theme together, sometimes talking to each other. The entrance of electronics makes the song really distinctive and unique. Improvisational parts are wonderful. A Picture of Doris Travelling with Boris: An electronically supported piano on the background is giving a loop-like melody in this perfect piece. We are again experiencing another outrageous performance with its all rise and falls. Esbjörn plays like telling a sad but exciting story to us without allowing us to breathe even for an instant. The contributions from Dan Berglund in transition parts and ever lasting energy of Magnus Öström proves us again what an irreplaceable band they are. Just listen to it. It needs no comment. What Though The Way May Be Long: The way is too long, it is 20 minutes on ears. The soft and dark end of the previous piece is, kind of, linked to the entrance of this piece. The piano is accompanying to itself at first. One hand is playing the melody, the other is carrying the rhythm. Its sound is a little bit intentionally distorted. Then the double-bass and drums enters the stage bravely and recursively for 20-30 seconds passages, between which the piano is performing solo. They have decided to give a solo to the double bass after the third minute. The double-bass is very lyrical. The piano did not give up to improvise, it is following the movements of the double bass asymmetrically. The main piece is ended at the sixth minute then a hidden track is there starting from 10:30 by some depressive sounds of bass, percussion and some whistles created by pipes. We hear Leucocyte-like sounds here from the piano. The bow is entering from left and travelling between two channels from time to time around both too lower octaves and too higher octaves.